Some of the most powerful forces occurring in change are both pre-existing political dynamics and those created when you implement change. People naturally want things to go their own way, to be viewed as “winners” in the change, and they behave in ways that benefit their own interests. Unfortunately, political maneuvering is rarely driven by what is good for the whole organization. Long before any major initiative is officially announced, personally motivated political behavior among the leaders who know something is coming escalates. Individuals and factions exert influence over others for their own agendas. Uncertainty, risk, and opportunity for power increase, especially when decision-making and authority may not be clear. In some cases, both covert and explicit power dynamics mushroom, leading to chaos, competition, and even malicious behavior. This is an unfortunate reality in corporate culture. An intriguing aspect of politics is that most people assume their attempts to influence others are invisible; most political maneuvering happens behind closed doors. Yet, people see these dynamics clearly, talk about them vigorously, and can even predict the outcomes. Political behavior is far more obvious than its perpetrators would like to believe. If people collude with the unconscious norm to not discuss negative political behavior overtly with the key actors, they are allowing the consequences to run rampant. This does not support the overall change or the long-term good of the organization. Politics can have a damaging effect on the success of your change. The extent of the damage depends on your organizational culture and the breadth of your change effort. It can slow things down, be a drag on the process, and sabotage the outcome. Political dynamics must be addressed and dealt with openly, consciously. Unless they are worked out through open dialogue, they can derail even the best of changes. 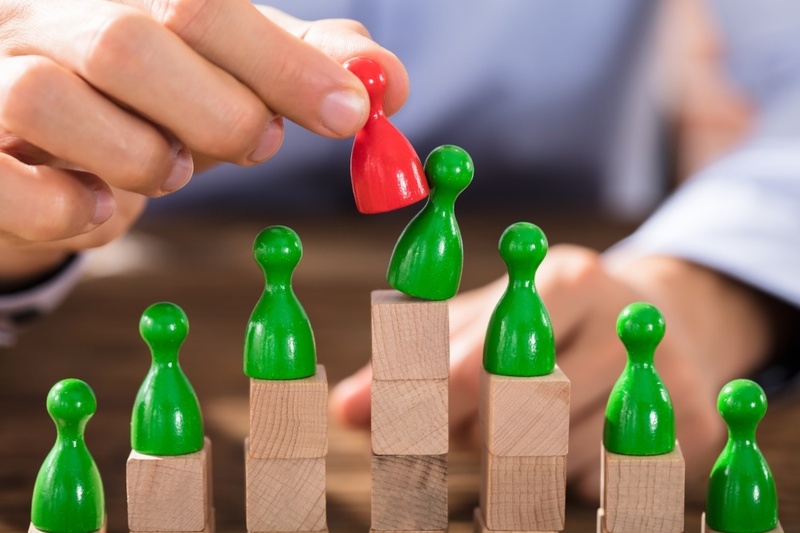 As uncomfortable as it may be to unravel political behavior, your leaders need to deal with their own power struggles that impact the transformation, as well as those within your project community and across the organization. Therefore, when leading transformational change, staying on top of the political terrain is critical to your shaping a sound and conscious change strategy for your effort. It is essential to create an open and honest climate within the change leadership team—and across the organization—for addressing difficult political realities. Relationship, team, and personal development work are key to the constructive resolution of potentially damaging politics. Building commitment and alignment to the over-arching outcomes of your transformation and your case for change and shared vision will help immensely. Create specific ground rules for dealing with negative political behavior when it arises. 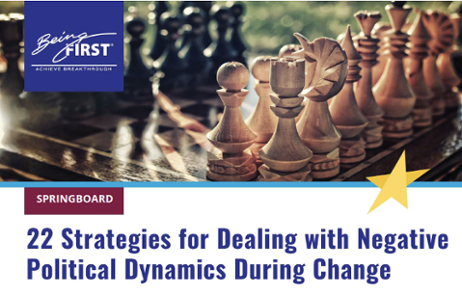 At this early stage in your change process, it is helpful to scan the existing political dynamics to identify the patterns currently at play, assess their impact on your transformation, and then devise positive strategies for how to deal with them. What ground rules and norms will your change leaders adopt to minimize any negative political behavior? What additional agreements need to be made to handle your existing or emerging negative political dynamics? What conditions must be in place for these ground rules and agreements to work for the life of your change effort, and beyond?How can you hold everyone accountable to live by them? We will call “Time Out” whenever we think a negative political dynamic, event, or behavior is happening or may start to happen. Then, we will describe what we think is occurring and talk it through constructively. We will orient ourselves to what is right for our larger system, rather than pursuing our own self-interests. We will tell the truth about what we see and where we are. We will seek mutual understanding rather than to blame or point fingers. We will strive to use these dynamics as opportunities to strengthen our working relationships and our effectiveness as a team. We will not blame or punish anyone who is involved in the dynamics as long as we can remedy them. What conditions must be in place for these ground rules and agreements to work for the life of your change effort, and beyond? How can you hold everyone accountable to live by them?